Figure A shows how the ultrasound probe is placed over the carotid artery. Figure B is a color ultrasound image showing blood flow (the red color in the image) in the carotid artery. Figure C is a waveform image showing the sound of flowing blood in the carotid artery. 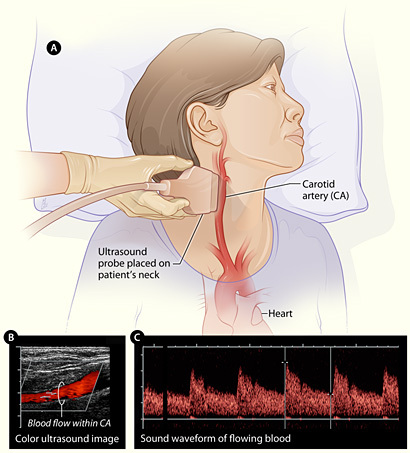 Carotid ultrasound is a painless and harmless test that uses high-frequency sound waves (see also ultrasound scanning) to create images of the insides of the two large arteries in the neck. These arteries, called carotid arteries, supply the brain with blood. There is one carotid artery on each side of the neck. Carotid ultrasound shows whether a material called plaque has narrowed the carotid arteries. Plaque is made up of fat, cholesterol, calcium, and other substances found in the blood. It builds up on the insides of the arteries as a person ages. A standard carotid ultrasound shows the structure of a carotid artery. It may include a Doppler ultrasound – a special ultrasound that shows the movement of blood through the blood vessels. A doctor often will need results from both types of ultrasound to fully assess if there is a problem with blood flow through the carotid arteries. Had a stroke or ministroke recently. Has an abnormal sound in the carotid artery called a carotid bruit. A doctor can hear a carotid bruit with the help of a stethoscope put on the neck over the carotid artery. A bruit can mean that there's a partial blockage in the carotid artery that could lead to a stroke. Sometimes carotid ultrasound is used as a preventive screening test in people who have medical conditions that increase their risk of stroke, including high blood pressure and diabetes. People with these conditions may benefit from having their carotid arteries checked regularly even if they show no signs of plaque buildup. Carotid ultrasound is a painless test, and typically there is little to do in advance. Patients are informed how to prepare for the procedure. Carotid ultrasound is usually done in a doctor's office or hospital. The test is painless and usually doesn't take more than 30 minutes. The ultrasound machine includes a computer, a video screen, and a transducer, which is a hand-held device that sends and receives ultrasound waves into and from the body. The patient lies down on his or her back on an exam table for the test. A technician or doctor puts a gel on the patient's neck where the carotid arteries are located. This gel helps the ultrasound waves reach the arteries better. The transducer is put against different spots on the neck and moved back and forth. The transducer gives off ultrasound waves and detects their echoes after they bounce off the artery walls and blood cells. Ultrasound waves can't be heard by the human ear. A computer uses the echoes of the ultrasound waves bouncing off the carotid arteries to create and record images of the insides of the arteries (usually in black and white) and the blood flowing through them (usually in color; this is the Doppler ultrasound). A video screen displays these live images for the doctor to review. Usually there is nothing special the patient has to do after a carotid ultrasound, and he or she should be able to return to normal activities immediately. Often the patient will be told the results of the carotid ultrasound when it occurs or soon afterward. What does carotid ultrasound show? A carotid ultrasound can show whether buildup of plaque has narrowed one or both of the carotid arteries and reduced blood flow to the brain. If the carotid arteries are narrowed by plaque, the patient may be at risk for having a stroke. That risk depends on how much of the artery is blocked and how much blood flow is restricted. To reduce the patient's risk for stroke, his or her doctor may recommend medical or surgical treatments to reduce or remove the plaque buildup in the carotid arteries.